A couple formed by Sagittarius and Sagittarius has very high levels of compatibility. However, before checking the compatibility, learn a bit more about each of these signs. Sagittarius is a sign represented by fire, which allows us to say that a combination of two people who share this sign can be seen as a completely formidable team. Some astrologers think this is a perfect combination, and in most cases, very appropriate. 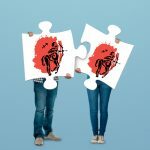 Sagittarius and Sagittarius: how will the relationship work? Sagittarius is a very carefree and independent sign, which means that both can work together on their projects. In a relationship the couple formed by two natives of Sagittarius, jealousy rarely poses any inconvenience, but we must also take into account that there is a possibility that Sagittarius can explode with anger at anything. Fortunately, these problems are not so great, which means they will certainly disappear very quickly, because this is not a spiteful sign. Jupiter governs the passion of Sagittarius, given that this planet promotes the pleasure of discovering and learning, both add their own brand of ideas, which will bring great stimulation to their relationship. Certainly, this is going to be a lovely couple that will have a good social life and a lot of fun. Two fire signs can set fire to the world because they are full of life and excited to discover different things around the world. As a sign of change, Sagittarius can get along very well with his partner and he can as well accommodate himself to all his desires. However, this very open nature allows his wishes of honesty in most cases to lead him to say exactly what he thinks, while a more diplomatic sign would remain silent to keep the peace. In addition, he also needs to control his impulses by wanting to take risks and play with his future to avoid falling into exciting, potentially damaging situations. This is a combination where none will certainly be bored, although there is a possibility of the relationship becoming unpredictable in the end. These types of sign always like to be with someone stronger who can give support in a crisis of confidence that can arise at any time. In the sexual area, as Sagittarius is a mutable sign, the union between the two Sagittarians will be adapted and the two will accommodate each other’s desires. Both seek to live atypical experiences, including having privacy in “forbidden areas” or unexpected situations.